2017 wrapped up for us in the shop with an order of 2 dories. 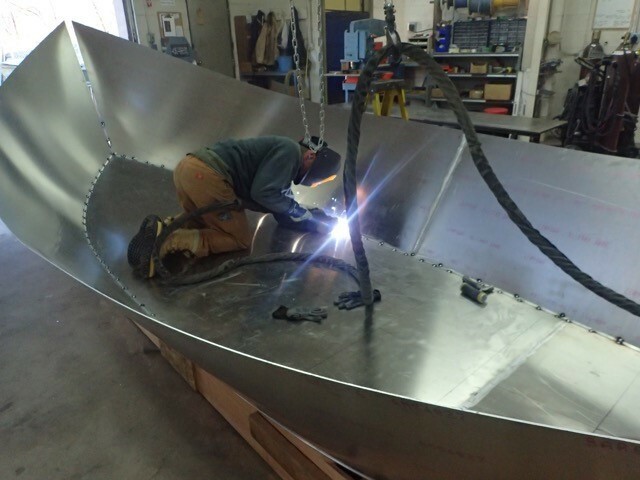 We we're lucky enough to get to work with AzRA and Brad Dimock on a new dory design. The hulls are what we’re calling a "Dimock" evolved Briggs design. The boats is 6% longer, 8% taller, and 10% wider than a standard Briggs hull. With commercial loads these days, the old Briggs style boat may be too small to do what is asked of it. 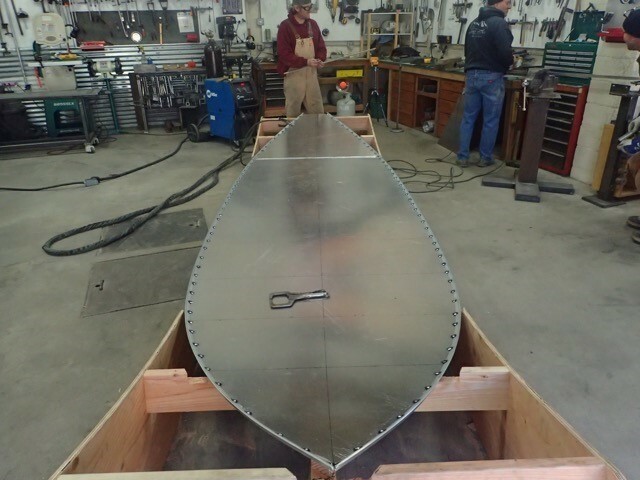 Overall the boats are going to be 17’10” in length, 88” in width, 52+" floor, transom ended, with a removable transom cap. To keep the floor stiffeners from communicating water, we are using 1” square tube that will be capped on the ends. And, because we have yet to find an extrusion that can accommodate the bow and transom angles, there are the doublers on the bow and the stern. Thanks Bob for the nice curves! All those hours playing with an erector set as a kid really helped when it came time to working with uni-strut. 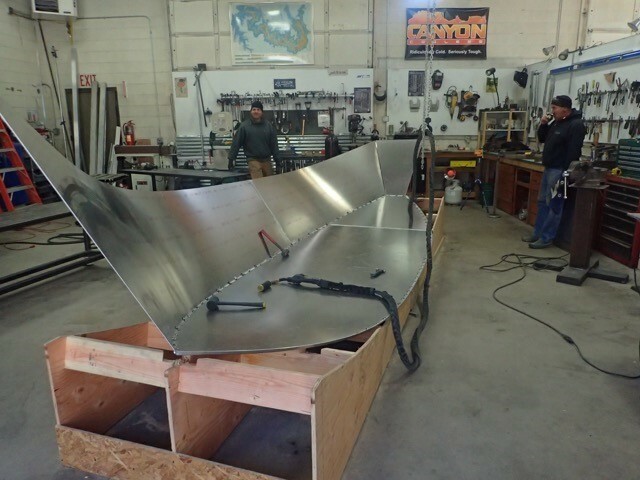 With a clamp every station, we can manipulate the curve to keep it fair and constant with the lofting plan. That’s Colin in the picture, pleased with how well we can hold the curve. 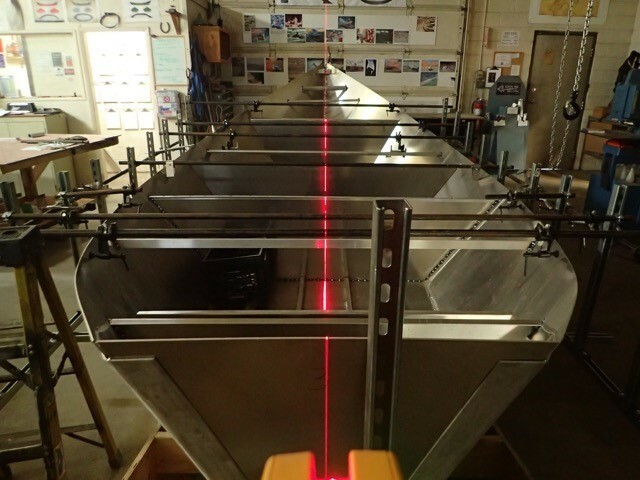 And then the laser keeps us honest.